A cat reportedly trekked 2,000 miles to find his owners after they moved house without him. Ravila Hairova, 52, thought her grey cat Karim would find the change too upsetting so she asked neighbours to take him in. She even left his favourite chair, cushion and food bowls behind in Gulistan, Uzbekistan, so he would feel at home. But two years later she found her bedraggled, starving pet waiting on her doorstep at her new home in Liska, Russia. "I knew he had disappeared from my neighbours' home a few days after we left which was very sad but we never heard another word about him," she said. 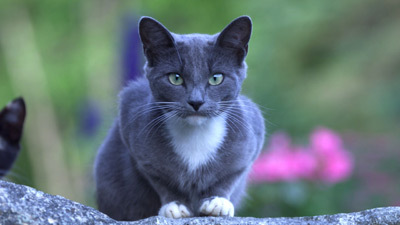 "Then I was walking along the road and I saw this cat which seemed to be waiting for me. When I go closer I saw it was Karim - thin, and in very poor condition but it was him. "He is very happy now and so are we. I've no idea how he found us but I'm very glad he did." Ravila's husband Lev Kondratyev, 46, said: "He looks like he used up all of his nine lives to get to us - but it's definitely him. "There are certain marks on his body including a scar on his tail when it was caught in the door that show us he is 100 per cent our Karim - and he obviously recognised us as well."